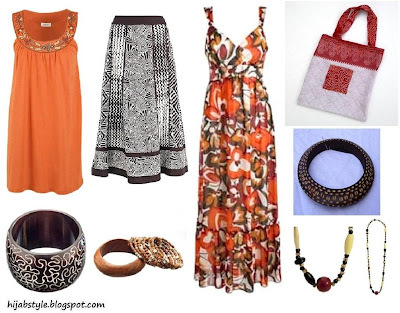 Orange beaded tunic £10, Matalan; Maldives skirt £50, Monsoon; tribal print maxi dress £45, Debenhams; Oneless bag £10, Adili; etched bangle £4, Ethical Superstore; wooden bangle set £4, Ethical Superstore; wooden bangle £6.99, Get Ethical; wooden beads necklace £10, Ethical Superstore. wooden bangles are very trendy, they look so funky wid outfits. i alwayz wear lots of chunky bangles to co-ordinate wid my outfits, and long necklaces. Orange looks great on darker skin tone.